Constant financial crises and growing protests over economic policies now punctuate the headlines. Personal crises, over debt or job insecurity, sadly punctuate our conversations with friends and family. Capitalism seems sick, or at least this version of it. So for those of us working on corporate social responsibility, social enterprise and responsible investment, how do we relate to these crises? If capitalism needs healing, are we acting as an anti-inflammatory, a placebo, or a potential cure? 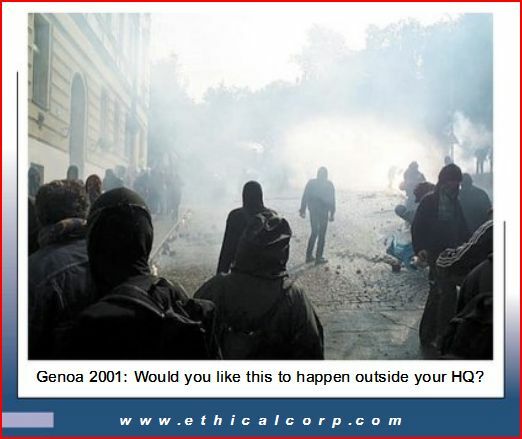 Ten years ago, the very first issue of Ethical Corporation magazine showed a picture of anti-globalisation protesters in Genoa on its front cover. The caption read “would you like this to happen outside your HQ.” The argument was that companies needed to be more responsible to avoid attack. Yet the causes that anti-globalisation protesters were raising, and that the OccupyWallStreet and related protesters raise today, are key to the future success of business, and ability of business people to have decent working lives. 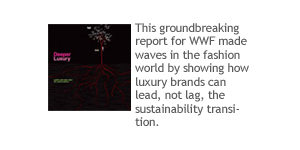 Today, to point to social unrest as cause for more CSR in its current form would be completely missing the point. Because unless there are systemic changes to economic governance, the very basis of a stable economy is under threat. So today, the question should be “Can your company afford not to support the protests?” Just as some companies supported (or didn’t sanction) their employees to take time off to protest during the Arab Spring, so companies can do the same for protests calling for deep economic and political reforms in Western countries. Over the past 16 years working in CSR I’ve sought to encourage and apply a “movement mentality”, being conscious of how we are working on something greater than building the reputation or business of an employer or client. We need to be clear that we are working as a social movement to transform all business and finance. So these times of instability require us to discuss with each other about how to have a far greater systemic effect that we currently have in our silos. They require us to look deeper our own sectors and how they contribute to systemic problems, and could contribute to systemic solutions. 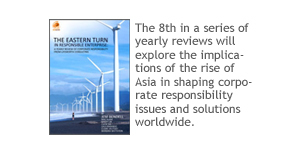 For instance, can people in responsible investment continue to consider the realm of high frequency trades and derivatives to be beyond their concern? Why accept impotence if you entered finance to have a greater impact? Having difficult conversations with colleagues is essential if we are to see deeper change that matches the challenges of economic governance today. Having unusual conversations with those outside our normal professional community is also now critical – listening to critics who are engaged in OccupyWallStreet and other campaigns is key. Learning together in this way, we may discover a more systemic agenda for our work, and begin healing capitalism. For your employees to learn in this way, they will need to get out of the office, and onto the streets. That’s why your company needs to OccupyWallStreet. 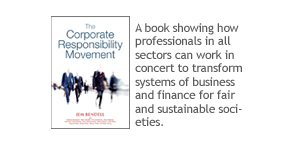 My own journey in CSR has led me to an understanding of systemic flaws, some of which are described in my book “The Corporate Responsibility Movement”. One systemic flaw I overlooked for too long is our monetary system. Beneath the financial and environmental crises lies a hidden crisis in the way our money is created. The way private banks create about 97% of our money as debt, out of nothing, and charge interest on it. That monetary policy choice is a cancer at the heart of our economies, meaning that our real economy, and our real wealth found in our environment and communities, is chewed up to service compound interest on perpetual debt. I explained in my TEDx talk in Rome last month that the solutions involve both monetary reform and scaling complementary currencies. Although many of the protesters’ initial demands are fairly mainstream reforms of banking and political process, discussions about the underlying causes of the current crises are happening and new initiatives around monetary reform are springing up. 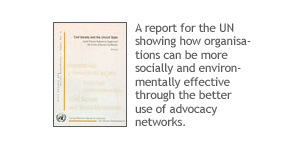 Initially it may seem difficult to see how companies can usefully engage in these issues. But I believe they can. All forms of business can begin to accept complementary currencies as payment, and offer to pay their employees partly in a complementary currency. Mobile phone companies can help scale complementary currencies through collaborating on sms payment systems. Retail banks can open accounts in complementary currencies. All firms can integrate complementary currencies into their philanthropy and community engagement. Firms can switch their accounts to banks who practice full reserve banking, such as the JAK members bank. Firms can encourage local governments to issue their own mutual credit systems, and for all governments to tax transactions in complementary currencies in such currencies, not national money. Firms can also back campaigns for ending fractional reserve banking, such as Positive Money, in the UK. Although much can be done, it would be naive to think that all firms and banks can find a win-win approach to monetary reform and monetary alternatives. Some banks will lose out if the right changes are implemented. Their commercial interests are our common enemy. Individuals in such banks could consider to donate their wages to groups campaigning for real change or creating real currency alternatives, like Community Forge. They could also leak documents to help future prosecutions, or expose the attitudes and approaches in their banks. And they could apply for jobs at banks that practice full reserve banking or provide innovative peer-to-peer lending. Movements need people on the inside and outside, but key is that we make sure we are having an impact, not just making excuses. Responsible companies should back protests for fundamental economic reform, like OccupyWallStreet. They should do this both for commercial reasons, given the economic damage caused by the current financial system. But they should also do it as an expression of the shared concerns of their stakeholders, including their staff and owners. It is time to cut out the cancerous monetary system. Otherwise we have no chance of healing capitalism, for a fairer and more sustainable way of life. l’ll expand on these themes in my next book “Healing Capitalism” (Bendell and Doyle, 2012 forthcoming Greenleaf Publishing). 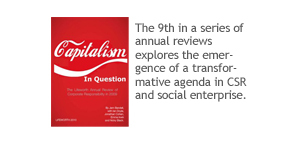 For now, to learn more, you can read the introduction to Capitalism in Question, and see the TEDx talk on money. I am currently researching how large organisations, including companies, can more effectively engage with complementary currencies. I’d welcome any information on this topic.